There are a several news articles that go into the background on chlorpyrifos and the EPA’s recent decision.3,5,6 However, after reading the articles, I still had a few questions. 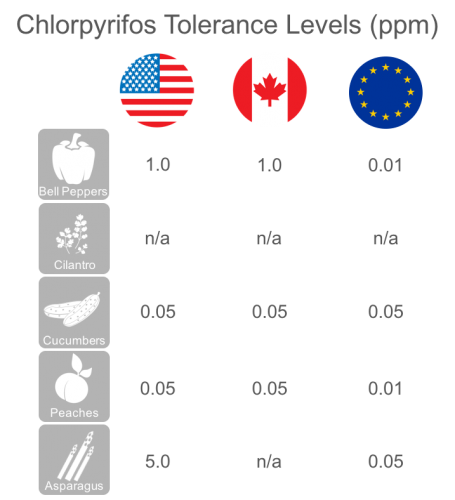 Specifically: what produce contain chlorpyrifos residue and how does the United States allowable residue levels compare with those of Canada and Europe? Every year, the USDA monitors pesticide residues on select fruits and vegetables and publishes the data through their Pesticide Data Program.7 These data are maintained in a database enabling anyone to search pesticide residue data for any combination of pesticides, produce, and years tested.8 Note: I discuss the USDA’s PDP in more depth in a post on Pesticides and Produce). Thirty four different fruits and vegetables with detectable chlorpyrifos residue may seem like a lot. 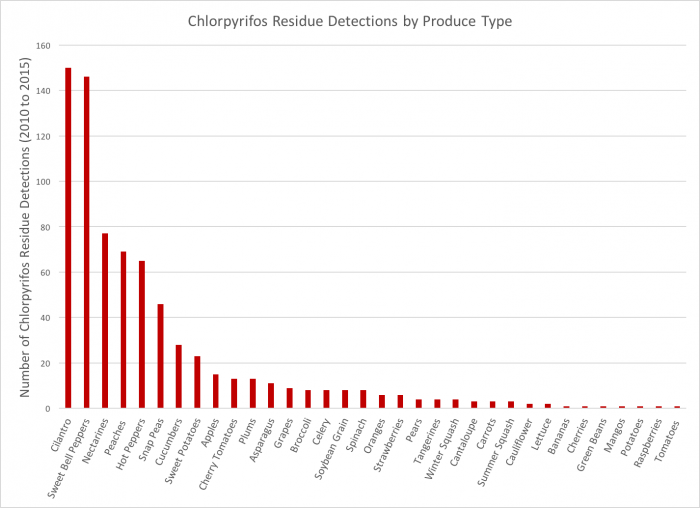 However, it should be pointed out that several of these fruits and vegetables had a single or very few chlorpyrifos residue detection(see graph below). Also, the USDA PDP testing is neither comprehensive nor consistent. They test a select list of produce from multiple states per year. And the list of produce they test changes each year.7 Therefore, it is impossible to know if 34 different fruits or veggies testing positive for chlorpyrifos is a lot or a little. 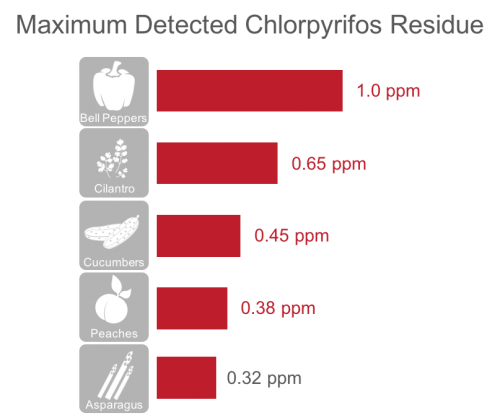 Frequency of Chlorpyrifos Detections in Produce. Data from 2010 to 2015 USDA Pesticide Data Program. Produce with highest number of chlorpyrifos residue detections. It would be wise to avoid fruits and vegetables that were found to frequently contain chlorpyrifos residue. 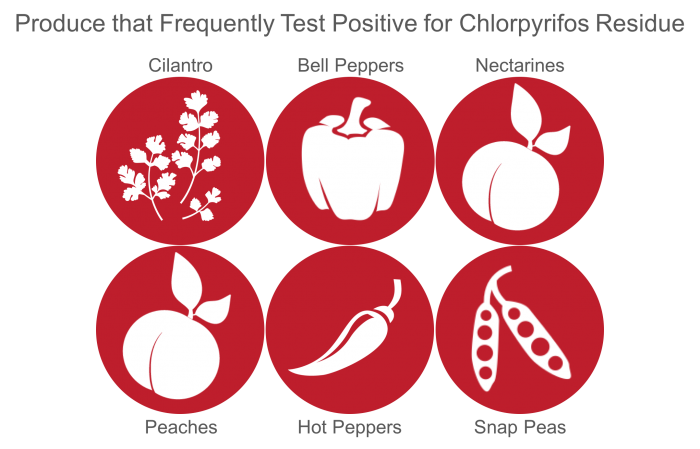 However, in addition to knowing what produce most often contain chlorpyrifos residue, it is important to know which fruits and veggies contain the highest levels of chlorpyrifos residue. To determine which produce contained the highest level of chlorpyrifos residue, I again searched the USDA PDP’s database for chlorpyrifos.8 This time, I sorted the data for the maximum detected residue (in parts per million). Below is a table highlighting the five highest levels of chlorpyrifos residue on produce detected between 2010 and 2015. Chart with maximum chlorpyrifos levels detected in annual USDA Pesticide Data Program analysis, years 2010 – 2015. Numbers in red indicate detected result at or above tolerance maximum. The values in the above table indicate the highest level of pesticide detected for that particular fruit or vegetable. Not all produce tested will have residue levels this high. 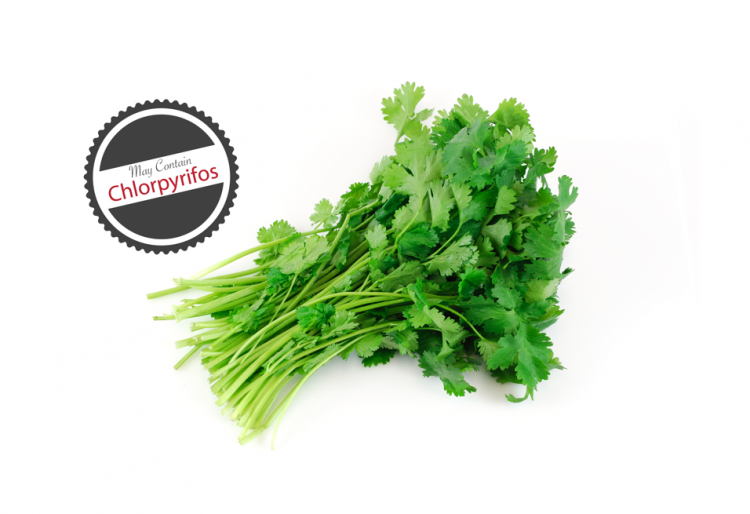 However, the above listed produce consistently had high levels of detected chlorpyrifos residue (i.e. the above numbers are not outliers). If the number is colored red, it means that the particular value meets or exceeds the US allowable limit for that particular fruit or vegetable. There is a growing body of data indicating a strong association between organophosphate pesticides and neurological problems (chlorpyrifos is one of many). Though the majority of the scientific data are for farm workers who have daily exposure to the pesticides, there is a small subset of clinical data that warrant rethinking our current position on using chlorpyrifos and other organophosphate pesticides in agriculture (for more information, read the post on Pesticides and Produce). Even though the EPA has decided not to ban the use of chlorpyrifos in farming applications, we can make a conscientious decision to reduce our exposure to chlorpyrifos and other organophosphate pesticides. Personally, I feel eating foods with chlorpyrifos residue is not worth the risk. I go out of my way to purchase organic cilantro, bell peppers, peaches and nectarines. And after researching this post, I am going to add asparagus and cucumbers to my “organic or pesticide-free only” list.